Provide comfort for the family of Zora Jane Sauve with a meaningful gesture of sympathy. 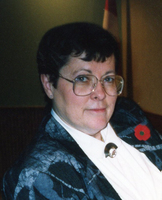 Beloved wife of William “Bill” Sauve predeceased in 2007. Loving and devoted mother of David Sauve (Maureen) of Ancaster, Ontario. Cherished grandmother of Lauren. Predeceased by her parents James and Laura “Frances” Dickson (nee Matchett). Jane was born on October 8th, 1936 in Timmins, Ontario. She went to the Marymount School of Nursing, graduating with the class of ‘58. To her, nursing was a calling. She worked in the Operating room at the General, cardiac pulmonary and the Emergency room at the Memorial past her 65th birthday. 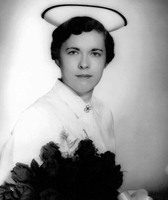 If she wasn’t nursing, her favourite thing to do was to go to a nursing alumnae event or have lunch with other nurses. She loved and was proud of her amazing son and her perfect granddaughter. She loved cheering for Canada in everything from Junior hockey to curling. She was often seen wearing something with a Canada logo walking one of her big mountain dogs Sara, Mike, Juno or Jake. Donations to the Alzheimer’s Society would be appreciated by the family. To send flowers in memory of Zora Jane Jane Sauve (Dickson), please visit our Heartfelt Sympathies Store. Consider providing a gift of comfort for the family of Zora Jane Sauve by sending flowers. We encourage you to share your most beloved memories of Zora Jane here, so that the family and other loved ones can always see it. You can upload cherished photographs, or share your favorite stories, and can even comment on those shared by others. David, Maureen and Lauren My thoughts and prayers are with you at this time of sadness Love "Poppa"
Co worker at Memo ER. Rest in peace.